to the places they visit by delivering basic first aid supplies to medical centers and remote community run health posts. 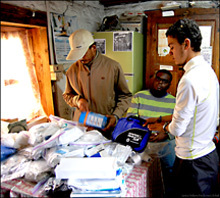 create innovative ways of delivering critical first aid supplies through the hands of individual adventure travelers. Ecuador, Sri Lanka, El Salvador and hurricane ravaged Biloxi, Mississippi. who want to make a difference by giving back to the places that they visit. Medicines Global serves as the parent organization for the Medicines Global Outdoor Youth Ambassador (MGOYA) program created in 2004.
boarding, rock climbing, kayaking, hiking, climbing and camping. MGOYA programs develop humanitarian, environmental and nutritional awareness.